it's the hack that's broken, not the emulator. it would behave the same way (crashing) on a real Neogeo. kawaks doesn't emulate the 68000 correctly so doesn't trigger the address error on the invalid access, that is a bug in kawaks. It is the only error that gives the game has other games like The King of Fighters 2002 Magic Plus III (which is a modification of MP2 to include Iori "Orochi") were also of an error in DM, before finalizing the DM , the CPU halt and the counter hits too, may amend any scam or another DM after this also only in mame. Anyway, there's an easy way around this, only for the X or Y game "work properly"? it's a hack, so obviously the checksums don't match what is expected of the original game, I'm not sure what your point is... The Unibios can't know the checksums of every dumb hack out there, there isn't enough space to store them. all your problems originate because you're running a hacked version of the game with incorrectly hacked game code. Robert, you said the problem has been fixed, but what exactly was the problem? 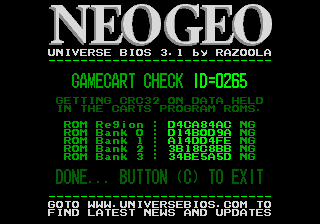 According Haze said above, was the problem of the game, not the emulator and it played in a real neogeo, happens the same error.